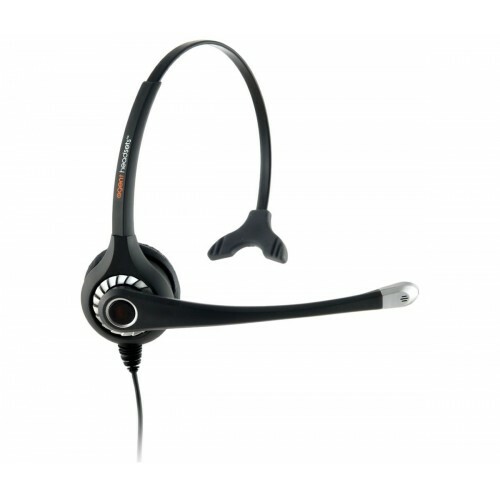 The Agent 700 is a stylish modern monaural headset offering a range of features for the modern call centre environment. This bundle also ships with a quick disconnect cable from Plantronics. Sporting wideband audio, acoustic shock protection and a dependable noise­cancelling microphone, the Agent 700 is ready for use in any busy or noisy call centre environment. Thanks to support for wideband audio, you can also enjoy crystal­clear phone calls in VoIP telephony environments. The Agent 700 is highly adjustable as well, sporting a 270­degree rotation microphone, a robust construction, an adjustable headband and a spare leatherette ear cushion. The single­ear design allows you to keep aware of those around you while on calls. Comfortable and providing excellent sound, the Agent 700 combined with the 3.5­metre Plantronics QD cable is suitable for any office. Perfect for call centre enviroment. Great noise reduction. Great you get a spare leather ear too.